With the increased usage of natural algal filtration, comes the increased usage of illumination to make the photosynthetic filtering process occur. However a certain type of metal-case light has come onto the market, and this light needs to be addressed because it is potentially unsafe when used on ATS algae turf scrubbers. We do not use these lights, but unfortunately other people do, and the corrosion of the metal case lets water reach the dangerous 240/120 volts inside. If you do not have these lights, then you can decide whether to get them or not. If you already have them, then you can learn how to protect yourself, although it safest to change the lights entirely. Over time, the problem of the metal case gets worse, not better. At some point the metal case will reach a critical point due to the corrosive operating environment of sump-mounted waterfall algae scrubbers, which is a much harsher environment than the outdoor gardens the lights were made for. Whether this is 6 months or 6 years depends on the light, the scrubber housing, the sump environment, and the usage. The simple solution is to just not use metal-case 240/120 volt lights. If you already have these lights, and you are not technically comfortable with electricity, the only safe solution is to have them replaced before corrosion breaks through the seal. Do not believe anyone who tells you their aluminum case lights will not corrode; all aluminum corrodes, especially near saltwater. Even if you have 1, 2 or 6 of these lights, and they've had no problems for years, that does not mean that other people should not be informed. Imagine if your car had a defect that only showed up for 1 in 100 people, and you were the one that got injured. Would you want the car company saying "There is no defect. We have a customer that has two of these cars and he's had them for three years; if there were a defect then he'd know about it." Of course not. You would want the pertinent information. And as a maker of LED lights, and being an Electrical Engineer, I feel I am qualified to provide this information. If you have additional information, you are invited to post it below, especially if you are a verifiable state-licensed electrician. Several "commercial" scrubber builders who use these lights were asked to provide input/articles to be included here, but nothing was received from any of them. Also I offered to provide free electrical design advice to improve the safety of their scrubbers, but all of them declined, saying their lights were not dangerous, even though they had no electrical training, experience, or certifications to back this up. 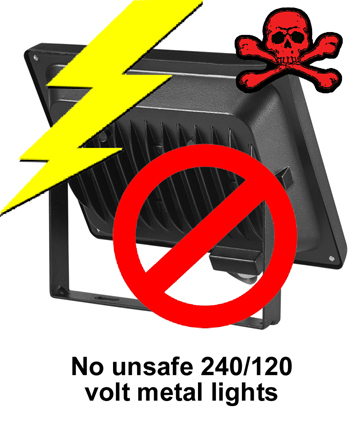 The following is one person's professional opinion on the safety of metal case, high voltage, algae scrubber lights. You should consult your own professional advice and opinion from an independent electrical engineer, electronics engineer, electrician, or safety technician before using these lights; if you are making, advertising or distributing these lights then you should also consult with a product liability attorney specializing in electrical injury. Again, we refuse to use or promote these lights. Last edited by SantaMonica; 01-26-2019 at 05:37 PM. Last edited by SantaMonica; 11-09-2018 at 10:07 AM. Last edited by SantaMonica; 11-09-2018 at 10:08 AM. The reason again is simple: Cost. Just $5 to $8 each, including shipping from China. But the Chinese know that if someone is injured because of these lights, nobody will be going to China to sue them. So the Chinese have absolutely no need to make things safer. It’s up to the DIY person to check each light (by taking it apart), and it’s up to each commercial scrubber maker to request UL certification, non-metal construction, low voltage operation, and hermetically sealed enclosures. Like we did with our GEM lights. Some people will say, "These lights are safe, because they were made for outdoor use in the rain". First of all, this is assuming that the lights were put together correctly in the first place. Open up a few and check for yourself to see if the ground is connected properly, or if it was just cut off completely. If it's not connected properly, you can forget any safe usage, anywhere. As a matter of fact, if the ground is not connected properly, usage in the corrosive saltwater environment of a sump is (at least) very dangerous, and in my opinion could be described as deadly, when the operator is an unsuspecting and non-electrically-aware consumer (or worse, their children, standing on a wet floor) who bought the scrubber thinking the manufacturer did all the proper safety designs and certifications. Second, even if it was put together correctly, usage in an outdoor area or garden usually means the light will be staked into the ground, or will be attached to a metal conduit, both of which provide a ground path if the internal 240/120 volt circuit gets shorted to the metal case. Plus, you don't normally touch, grab, or usually even go near these outdoor lights in a garden. So even if they shorted internally to the metal case, and even if the ground wire were missing, you would not be anywhere near it. It's bad enough that the ground might not be connected, but regardless, the installation is on the top of sump that is not grounded. It's not a garden bed, and it's not a metal conduit grounded to a house. Instead it's an electrically-floating acrylic box filled with water. It's a really, really bad place to have a possibly non-grounded product, or even a grounded product that is likely to eventually leak. 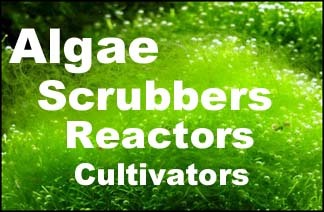 And the usage requirements of these scrubbers requires weekly, and sometimes daily, touching and grabbing of the lights. With wet hands, and while standing on a wet floor. Ask any licensed electrician if he would like to be doing this. The 240/120 volt power supply in these lights is inside the metal case which holds the rubber seal in place. All metal corrodes, especially aluminum, and especially in saltwater, and when the metal corrodes enough around the seal, the seal will leak. And the most dripped-on part of the light is the top, and that is directly above the internal power. So, the water drips down directly onto the high voltage inside. Look at how the lights are usually mounted: the seam of the seal at the top is directly over the internal power supply. They're terrible. I bought some with 660nm leds in and they came supplied with only live and neutral had to fit a new 3 core cable. Amazes me how UK sellers are not prosecuted for selling these. My understanding is that UK/EU sellers are required to have proof of safety certification of the entire product before selling or distributing it. This requirement does not exist in the U.S., however, when a consumer injury occurs in the U.S., a product liability attorney will usually go after the manufacturer and also the distributor/reseller that sold the product to the injured consumer.